In honor of the recent hit animated feature “Zootopia,” we’re introducing you to some of the animals from Anchorage’s “mammal metropolis” better known as the Alaska Zoo. If you get the chance to visit the zoo, you’ll meet and learn about the residents that make it a popular destination in Alaska’s largest city. And during more than 40 years since the zoo first opened its doors, it has had a few memorable characters along the way. Perhaps one of the most well-known animals to reside at the zoo, Maggie the African elephant was loved so much that her story still makes headlines to this day. The orphaned, one-year-old elephant came to live at the Alaska Zoo in 1983, joining Annabelle, the zoo’s resident Asian elephant. Maggie lived at the zoo for 24 years and served as the zoo’s main attraction. But after several bouts of illness, the zoo decided that Maggie needed socialization with other elephants and should be relocated to a more suitable, southern climate where she would have the space to roam. In November 2007, Maggie made the big move from Alaska to an animal sanctuary in San Andreas, California. She was transported in an Air Force cargo jet. Today, elephant life keeps Maggie busy and happy. And while she’s hundreds of miles away, she’s remembered fondly here in Alaska. In fact, if you ask a local about Maggie, there’s a good chance they’ll have a story or two to share. 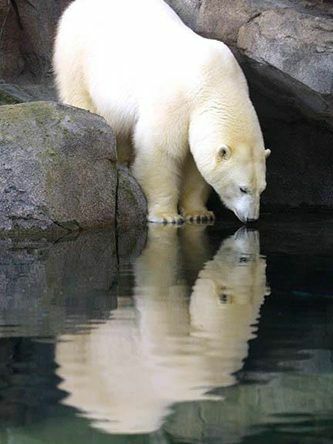 The Alaska Zo o’s female polar bear Ahpun (pronounced “awe-pune”) has been a zoo favorite since she first arrived as an orphaned cub in 1998. Around the same time, the zoo took in another orphaned bear cub—a female brown bear cub named Oreo—and decided to introduce the two. They had a lot in common, both were orphaned after their mothers were shot by hunters, both were about the same age. For about five years, the bears were a main attraction for the zoo; guests marveled at the bears’ friendly antics. Ahpun and Oreo often wrestled, played together with their toys and groomed each other. They also slept side by side. But as the bears grew older, they grew apart. Oreo became more aggressive toward Ahpun. 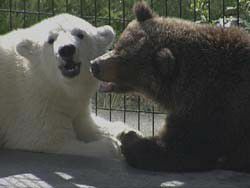 In 2003, the zoo was forced to separate the brown bear and the polar bear, and stated that the former “childhood friends” would lead separate lives. 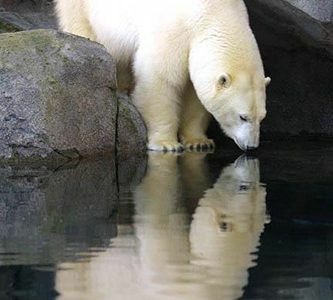 Today, the bears are enjoying their separate lives within the Alaska Zoo and each has a companion. Oreo is back to entertaining zoo guests after a restful winter slumber. As for Ahpun, zoo staff are optimistic that she will soon become a mama bear. If the zoo gave out a “most social” award, there’s no question it would go to George the magpie. He’s beloved by zoo staff and visitors, and the 3,500 friends that follow his Facebook page. George came to the zoo voluntarily—he befriended a zookeeper who took him to the Bird Treatment and Learning Center for rehabilitation. George spent months at the center until he started to talk. Bird TLC staff say his first words were “Hi, George!” After that, the Alaska Zoo became his permanent home. Years later, George has an extensive vocabulary and will carry conversations with people. He’s also known for his mimicking skills and his wolf whistle. While George picked his home at the Alaska Zoo, he still maintains friendships with magpie friends in the wild. They often visit his enclosure and George gives them items from his toy collection, in hopes that they will trade him something in return. If you visit the zoo, be sure to stop by and say hello to George. Chances are, he’ll greet you right back and maybe even strike up a friendly conversation.